For other uses, see Ferrite (disambiguation). A ferrite is a ceramic material made by mixing and firing large proportions of iron(III) oxide (Fe2O3, rust) blended with small proportions of one or more additional metallic elements, such as barium, manganese, nickel, and zinc. They are both electrically non-conductive, meaning that they are insulators, and ferrimagnetic, meaning they can easily be magnetized or attracted to a magnet. Ferrites can be divided into two families based on their resistance to being demagnetized (magnetic coercivity). Hard ferrites have high coercivity, so are difficult to demagnetize. They are used to make permanent magnets for applications such as refrigerator magnets, loudspeakers, and small electric motors. Soft ferrites have low coercivity, so they easily change their magnetization and act as conductors of magnetic fields. They are used in the electronics industry to make efficient magnetic cores called ferrite cores for high-frequency inductors and transformers, and in various microwave components. Ferrite compounds are extremely low cost, being made of mostly rusted iron (iron oxide), and have excellent corrosion resistance. They are very stable and difficult to demagnetize, and can be made with both high and low coercive forces. Yogoro Kato and Takeshi Takei of the Tokyo Institute of Technology synthesized the first ferrite compounds in 1930. Ferrites are usually ferrimagnetic ceramic compounds derived from iron oxides. Magnetite (Fe3O4) is a famous example. Like most of the other ceramics, ferrites are hard, brittle, and poor conductors of electricity. Ferrite crystals do not adopt the ordinary spinel structure, but rather the inverse spinel structure: One eighth of the tetrahedral holes are occupied by B cations, one fourth of the octahedral sites are occupied by A cations. and the other one fourth by B cation. It is also possible to have mixed structure spinel ferrites with formula [M2+1−δFe3+δ][M2+δFe3+2−δ]O4 where δ is the degree of inversion. Some ferrites adopt hexagonal crystal structure, like barium and strontium ferrites BaFe12O19 (BaO:6Fe2O3) and SrFe12O19 (SrO:6Fe2O3). In terms of their magnetic properties, the different ferrites are often classified as "soft", "semi-hard" or "hard", which refers to their low or high magnetic coercivity, as follows. Ferrites that are used in transformer or electromagnetic cores contain nickel, zinc, and/or manganese compounds. They have a low coercivity and are called soft ferrites. The low coercivity means the material's magnetization can easily reverse direction without dissipating much energy (hysteresis losses), while the material's high resistivity prevents eddy currents in the core, another source of energy loss. Because of their comparatively low losses at high frequencies, they are extensively used in the cores of RF transformers and inductors in applications such as switched-mode power supplies and loopstick antennas used in AM radios. Manganese-zinc ferrite (MnZn, with the formula MnaZn(1-a)Fe2O4). MnZn have higher permeability and saturation induction than NiZn. Nickel-zinc ferrite (NiZn, with the formula NiaZn(1-a)Fe2O4). NiZn ferrites exhibit higher resistivity than MnZn, and are therefore more suitable for frequencies above 1 MHz. For applications below 5 MHz, MnZn ferrites are used; above that, NiZn is the usual choice. The exception is with common mode inductors, where the threshold of choice is at 70 MHz. Cobalt ferrite, CoFe2O4 (CoO·Fe2O3), is in between soft and hard magnetic material and is usually classified as a semi-hard material. It is mainly used for its magnetostrictive applications like sensors and actuators  thanks to its high saturation magnetostriction (~200 ppm). CoFe2O4 has also the benefits to be rare-earth free, which makes it a good substitute for Terfenol-D. Moreover, its magnetostrictive properties can be tuned by inducing a magnetic uniaxial anisotropy. This can be done by magnetic annealing, magnetic field assisted compaction, or reaction under uniaxial pressure. This last solution has the advantage to be ultra fast (20 min) thanks to the use of spark plasma sintering. The induced magnetic anisotropy in cobalt ferrite is also beneficial to enhance the magnetoelectric effect in composite. In contrast, permanent ferrite magnets are made of hard ferrites, which have a high coercivity and high remanence after magnetization. 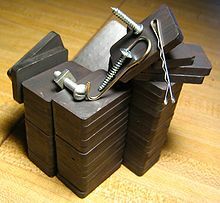 Iron oxide and barium or strontium carbonate are used in manufacturing of hard ferrite magnets. The high coercivity means the materials are very resistant to becoming demagnetized, an essential characteristic for a permanent magnet. They also have high magnetic permeability. These so-called ceramic magnets are cheap, and are widely used in household products such as refrigerator magnets. The maximum magnetic field B is about 0.35 tesla and the magnetic field strength H is about 30 to 160 kiloampere turns per meter (400 to 2000 oersteds). The density of ferrite magnets is about 5 g/cm3. Strontium ferrite, SrFe12O19 (SrO·6Fe2O3), used in small electric motors, micro-wave devices, recording media, magneto-optic media, telecommunication and electronic industry. Barium ferrite, BaFe12O19 (BaO·6Fe2O3), a common material for permanent magnet applications. Barium ferrites are robust ceramics that are generally stable to moisture and corrosion-resistant. They are used in e.g. loudspeaker magnets and as a medium for magnetic recording, e.g. on magnetic stripe cards. After this step, the two oxides combine to give the ferrite. The resulting mixture of oxides undergoes sintering. Having obtained the ferrite, the cooled product is milled to particles smaller than 2 µm, sufficiently small that each particle consists of a single magnetic domain. Next the powder is pressed into a shape, dried, and re-sintered. The shaping may be performed in an external magnetic field, in order to achieve a preferred orientation of the particles (anisotropy). Small and geometrically easy shapes may be produced with dry pressing. However, in such a process small particles may agglomerate and lead to poorer magnetic properties compared to the wet pressing process. Direct calcination and sintering without re-milling is possible as well but leads to poor magnetic properties. Electromagnets are pre-sintered as well (pre-reaction), milled and pressed. However, the sintering takes place in a specific atmosphere, for instance one with an oxygen shortage. The chemical composition and especially the structure vary strongly between the precursor and the sintered product. To allow efficient stacking of product in the furnace during sintering and prevent parts sticking together, many manufacturers separate ware using ceramic powder separator sheets. These sheets are available in various materials such as alumina, zirconia and magnesia. They are also available in fine, medium and coarse particle sizes. By matching the material and particle size to the ware being sintered, surface damage and contamination can be reduced while maximizing furnace loading. Ferrite cores are used in electronic inductors, transformers, and electromagnets where the high electrical resistance of the ferrite leads to very low eddy current losses. They are commonly seen as a lump in a computer cable, called a ferrite bead, which helps to prevent high frequency electrical noise (radio frequency interference) from exiting or entering the equipment. Early computer memories stored data in the residual magnetic fields of hard ferrite cores, which were assembled into arrays of core memory. Ferrite powders are used in the coatings of magnetic recording tapes. One such type of material is iron (III) oxide. Ferrite particles are also used as a component of radar-absorbing materials or coatings used in stealth aircraft and in the absorption tiles lining the rooms used for electromagnetic compatibility measurements. Most common audio magnets, including those used in loudspeakers and electromagnetic instrument pickups, are ferrite magnets. Except for certain "vintage" products, ferrite magnets have largely displaced the more expensive Alnico magnets in these applications. Ferrite nanoparticles exhibit superparamagnetic properties. Yogoro Kato and Takeshi Takei of the Tokyo Institute of Technology synthesized the first ferrite compounds in 1930. This led to the founding of TDK Corporation in 1935, to manufacture the material. Barium hexaferrite (BaFe12O19) was discovered in 1950 at the Philips Natuurkundig Laboratorium (Philips Physics Laboratory). The discovery was somewhat accidental—due to a mistake by an assistant who was supposed to be preparing a sample of hexagonal lanthanum ferrite for a team investigating its use as a semiconductor material. On discovering that it was actually a magnetic material, and confirming its structure by X-ray crystallography, they passed it on to the magnetic research group. Barium hexaferrite has both high coercivity (170 kA/m) and low raw material costs. It was developed as a product by Philips Industries (Netherlands) and from 1952 was marketed under the trade name Ferroxdure. The low price and good performance led to a rapid increase in the use permanent magnets. In the 1960s Philips developed strontium hexaferrite (SrFe12O19), with better properties than barium hexaferrite. Barium and strontium hexaferrite dominate the market due to their low costs. However other materials have been found with improved properties. BaFe2+2Fe3+16O27 came in 1980. and Ba2ZnFe18O23 came in 1991. ^ Carter, C. Barry; Norton, M. Grant (2007). Ceramic Materials: Science and Engineering. Springer. pp. 212–15. ISBN 978-0-387-46270-7. ^ Okamoto, A. (2009). "The Invention of Ferrites and Their Contribution to the Miniaturization of Radios". 2009 IEEE Globecom Workshops. pp. 1–42. doi:10.1109/GLOCOMW.2009.5360693. ISBN 978-1-4244-5626-0. ^ Shriver, D.F. ; et al. (2006). Inorganic Chemistry. New York: W.H. Freeman. ISBN 978-0-7167-4878-6. ^ a b c Ullah, Zaka; Atiq, Shahid; Naseem, Shahzad (2013). "Influence of Pb doping on structural, electrical and magnetic properties of Sr-hexaferrites". Journal of Alloys and Compounds. 555: 263–267. doi:10.1016/j.jallcom.2012.12.061. ^ Hosni (2016). "Semi-hard magnetic properties of nanoparticles of cobalt ferrite synthesized by the co-precipitation process". ^ Olabi (2008). "Design and application of magnetostrictive materials". ^ Sato Turtelli; et al. (2014). "Co-ferrite – A material with interesting magnetic properties". Iop Conference Series: Materials Science and Engineering. 60: 012020. doi:10.1088/1757-899X/60/1/012020. ^ J. C. Slonczewski (1958). "Origin of Magnetic Anisotropy in Cobalt-Substituted Magnetite". Physical Review. 110 (6): 1341–1348. doi:10.1103/PhysRev.110.1341. ^ Lo (2005). "Improvement of magnetomechanical properties of cobalt ferrite by magnetic annealing". ^ Wang (2015). "Magnetostriction properties of oriented polycrystalline CoFe2O4". ^ Aubert, A. (2017). "Uniaxial anisotropy and enhanced magnetostriction of CoFe2O4 induced by reaction under uniaxial pressure with SPS". Journal of European Ceramic Society. 37 (9): 3101–3105. arXiv:1803.09656. doi:10.1016/j.jeurceramsoc.2017.03.036. ^ Aubert, A. (2017). "Enhancement of the Magnetoelectric Effect in Multiferroic CoFe2O4/PZT Bilayer by Induced Uniaxial Magnetic Anisotropy". IEEE Transactions on Magnetics. 53 (11): 1–5. arXiv:1803.09677. doi:10.1109/TMAG.2017.2696162. ^ "Barium Carbonate". Chemical Products Corporation. Archived from the original on 1 February 2014. Retrieved 18 January 2014. ^ "Amorphous Magnetic Cores". Hill Technical Sales. 2006. Retrieved 18 January 2014. ^ Marc de Vries, 80 Years of Research at the Philips Natuurkundig Laboratorium (1914-1994), p. 95, Amsterdam University Press, 2005 ISBN 9085550513. ^ Raul Valenzuela, Magnetic Ceramics, p. 76, Cambridge University Press, 2005 ISBN 0521018439. ^ Lotgering, F. K.; Vromans, P. H. G. M.; Huyberts, M. A. H. (1980). "Permanent‐magnet material obtained by sintering the hexagonal ferriteW=BaFe18O27". Journal of Applied Physics. 51 (11): 5913–5918. doi:10.1063/1.327493. ^ Raul Valenzuela, Magnetic Ceramics, p. 76-77, Cambridge University Press, 2005 ISBN 0521018439. What are the bumps at the end of computer cables?